Direct property has an important role to play in multi-asset portfolios offering yield, diversification and inflation-hedging benefits. Investors unable, or not inclined to purchase individual commercial warehouses, shopping centres or office blocks directly can achieve exposure to the asset class via diversified open ended funds or listed Real Estate Investment Trusts (REITs). There are several reasons why we at Hawksmoor Fund Managers believe that the closed-ended REIT structure is by far the more appropriate vehicle. We have made this argument before but revisiting is apposite given the Financial Conduct Authority’s recent consultation on potential new rules that seek to reduce the risk to investors in open-ended funds that hold illiquid assets such as physical property. The regulator has also increased its scrutiny of the sector and is in daily contact with managers regarding the health of their underlying portfolios. The fourth quarter of 2018 saw UK property funds suffer net outflows of £336m sparking concerns that a re-run of 2016, when a number of open-ended property funds suspended trading in the face of heavy redemptions, might be on the cards. In response to the latest bout of selling, Columbia Threadneedle and Kames shifted from offer to bid pricing resulting in net asset value (NAV) declines of around 6%. This swing pricing mechanism is employed by open-ended managers to help protect long term investors from the dilutive impact of trading in the fund’s underlying assets. When net inflows are strong the NAV swings upwards to offer basis but when redemptions are high the opposite occurs with the NAV moving to bid basis. The high transaction costs associated with buying and selling property means that the spread between the bid and offer price is wide which in turn can result in the large NAV movements illustrated below. In February 2019, rating agency Fitch warned that open-ended funds are poorly equipped to deal with an expected spike in outflows in the coming months and whilst many funds hold higher cash balances than they did in June 2016, the ratings agency still believes that there is insufficient liquidity to prevent suspensions and other withdrawal restrictions. Ultimately, risks around gating and volatility associated with swing pricing, which always lurk in the background due to the fundamental liquidity mismatch inherent in open-ended property funds, are particularly prevalent in the current environment. In the interests of balance, there is of course a valid argument that the gating mechanism helps protect existing investors and that the swing-pricing inspired volatility in open-ended funds is more than mirrored in the closed-ended space due to widening discounts (further magnified by gearing). Indeed, in the aftermath of the June 2016 referendum vote, the discounts on UK Commercial Property Trust and F&C Commercial Property Trust, two of the larger listed generalist REITs, blew out to around 20% having traded at or above par as recently as April of that year. On the issue of gating, the FCA’s consultation recognises that the suspensions of 2016 were temporary in nature and generally worked, protecting investors from the negative consequences of forced selling. The regulator’s views aside, the point remains that open-ended funds are meant to be daily dealing but in certain circumstances are unable to meet that obligation. Furthermore, it seems likely that withdrawal restrictions will become more commonplace in the future with the regulator suggesting trading should be suspended if independent valuers express uncertainty around the value of 20% or more of the portfolio. Given low transactions and problematic price discovery in the retail sector, it is not hard to imagine suspensions happening more often, whilst the regulator’s drive to improve disclosure regarding liquidity risks has the potential to exacerbate the problem around net flows. 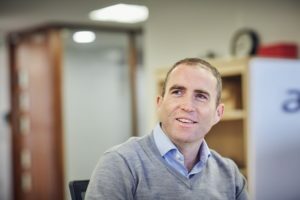 Over the past 2 years, the IA UK Direct Property Sector, in aggregate, has delivered positive returns with limited volatility which seems anomalous considering the anecdotal evidence from the retail sector and when compared with the negative returns of equivalent REITs and listed property companies. 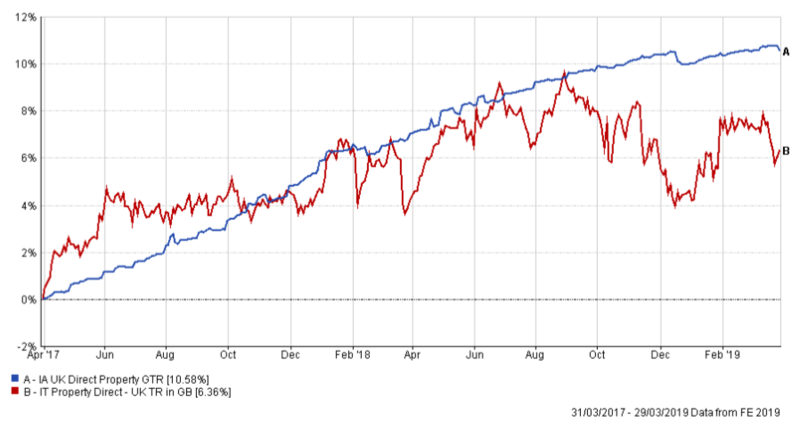 We have argued before that the serene pricing of open-ended funds may prove to be overly optimistic and that their relative price outperformance is vulnerable to unwind as NAVs begin to reflect more accurate valuations. REITs on the other hand, have already taken a hit in the form of widening discounts as investors move to price in perceptions of true value. On a total return basis, the quantum of REIT underperformance is significantly lower due to the higher average income yields available. 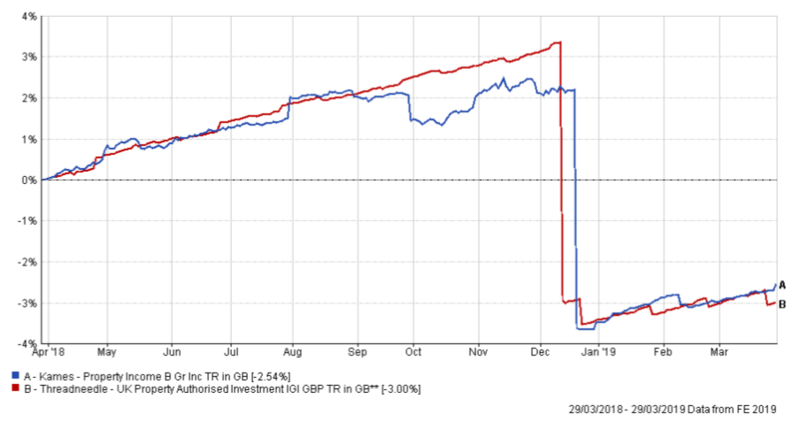 It’s also worth pointing out that the chart below compares open-ended fund performance with the generalist property investment trust sector which, as discussed later, does not constitute a fair reflection of our more targeted REIT exposure. One way for open-ended property funds to mitigate liquidity and suspension risk, is to hold high levels of cash which has an inevitably dilutive impact on returns. According to research from Canaccord, for every £1 invested in large open-ended property funds, investors on average get only 78p of property exposure. The fact that funds charge an annual management fee on the cash element of the portfolio rubs salt in the wound. In contrast, due to their fixed capital nature, REITs can remain fully invested and furthermore can enhance exposure through their ability to use gearing. Implications for potential relative returns should be stark for long-term investors who wish to capture the asset class’s attractive income streams or who expect capital values to rise. 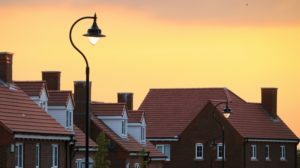 Evidence suggests that open-ended property funds have been adding to their cash buffers recently, which seems entirely natural given the regulator’s greater scrutiny and the increase in net withdrawals. We are hearing, however, that in the absence of buyers in the troubled retail sector, managers have been forced to sell more attractive properties in the industrial and alternatives space, leaving portfolios with undesirable skews. Most open-ended funds are generalist in nature and will have exposure to offices, industrials and retail, with the latter accounting for over a third of portfolio totals on average. We favour a more targeted approach to property with the existence of specialist REITs enabling us to gain specific exposure to warehouses, nursing homes, supermarkets and residential property where we have greater confidence in the underlying lease structures and sustainability of income streams. The use of REITs in our funds, help us deliver diversified exposure to property sub-sectors that we believe offer the best risk-return profiles in the most efficient manner possible, whilst protecting investors from the cash drag and suspension risks associated with open-ended property funds. With the regulator circling and outflows accelerating, the health warnings associated with these vehicles should be more pronounced than ever. This financial promotion is issued by Hawksmoor Fund Managers which is a trading name of Hawksmoor Investment Management (“Hawksmoor”). Hawksmoor is authorised and regulated by the Financial Conduct Authority. Hawksmoor’s registered office is 2nd Floor Stratus House, Emperor Way, Exeter Business Park, Exeter, Devon EX1 3QS. Company Number: 6307442. This document does not constitute an offer or invitation to any person, nor should its content be interpreted as investment or tax advice for which you should consult your financial adviser and/or accountant. The information and opinions it contains have been compiled or arrived at from sources believed to be reliable at the time and are given in good faith, but no representation is made as to their accuracy, completeness or correctness. Any opinion expressed in this document, whether in general or both on the performance of individual securities and in a wider economic context, represents the views of Hawksmoor at the time of preparation and may be subject to change. Past performance is not a guide to future performance. The value of an investment and any income from it can fall as well as rise as a result of market and currency fluctuations. You may not get back the amount you originally invested. HA3263.